Punk's brightest stars are hard at work on the road at the minute as part of the Give It A Name Introduces tour. Often a barometer of who'll be massive in the not too distant future, the jaunt recently concluded after taking in the length and breadth of the UK. 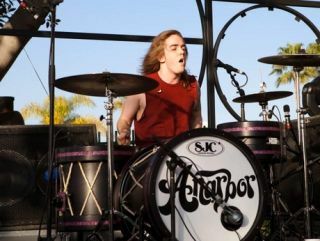 Rhythm caught up with Greg Garrity, drummer for fast-rising US pop punkers Anarbor, to find out just what goes on during a typical day on punk's hottest tour. 11:00: "We wake up and have tea. Normally we have coffee in America but they have tea here so we have that. It's kinda weird." 12:00: "The drives on this tour are really short, our longest drive is four hours. So we drive to the venue and everyone busts out the football and we play a little soccer." 15:00: "We load in and three of us on this tour are using an SJC kit so we set up and get a consensus of where everything should go and heights and everything. We tune the kit and set up. I've cracked a cymbal on this tour, which is obviously going to happen. I'm completely out of my element here so I can't drill the crack, but as soon as I get to the States I'll probably do that. 17:00: "We hang out and have a couple of beers. We've been going to the pubs lately because in America you need to be 21 and we're 20, so we can drink legally here." 19:00: "Then you figure out your set list and wait around until you play. We go hang out at the merch table and hang with the kids, then play the show." 23:00: "After that you load out, go to the hotel or your friend's house and just crash out." Anarbor's new album The Words You Don't Swallow is out now.